Jan is Associate Dean for Public Health and Professor of Medicine at the Larner College of Medicine at the University of Vermont. She earned an AB from Middlebury College, MD from the University of Cincinnati College of Medicine, and Master of Public Health (MPH) at the Harvard School of Public Health. 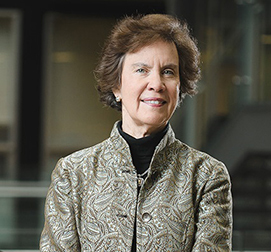 Prior to her full-time faculty appointment at the Larner College of Medicine at the University of Vermont, she served as Vermont’s Commissioner of Health from 1989-2003, under three gubernatorial administrations. Dr. Carney is board-certified in Internal Medicine and Public Health & General Preventive Medicine and works in public health and health policy education, research, practice, and service. At the University of Vermont, she teaches medical, graduate and Honors College students, and developed and directs the University of Vermont’s Graduate Public Health Programs. She is Director of the Rural Health Research and Delivery Core of the Northern New England Clinical and Translational Research Network Grant, funded by the National Institutes of Health. She serves on the Health and Public Policy Committee (Vice-Chair) and Advisory Board for Patient Partnership in Healthcare of the American College of Physicians. She received the first “Public Health Champion” Award from the Vermont Public Health Association in May 2018.